After years of rambling along the back roads of Central Texas visiting famous barbecue joints, barbecue hounds are realizing they don’t have to drive hundreds of miles for their fix. 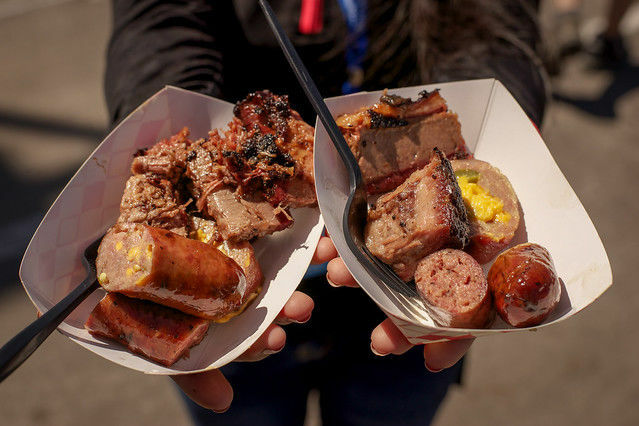 Shifting their travels to the length and breadth of greater Houstonia, what they’ve found is a thriving barbecue culture that easily rivals that of Central Texas. That culture has been enriched in recent years by older joints that have stepped up their game and by newer joints that are combining the Southern and African American tradition of East Texas barbecue with influences from the German meat markets of Central Texas and the Cajun/Creole cooking of Louisiana. 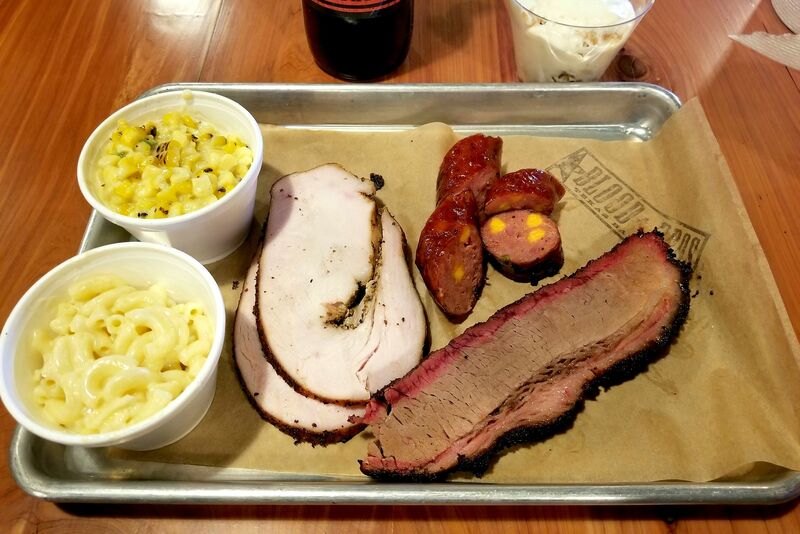 It’s a great time to be eating barbecue in Houston. Here are ten of my favorite places to get some (in no particular order). What some consider the best barbecue in the greater Houston area is produced out of a tiny trailer in a wind-swept Ace Hardware parking lot in Cypress. Owner Trent Brooks learned how to barbecue from his dad, who runs a barbecue catering operation in Acres Homes. Now, with help from wife Norma, Brooks is selling barbecue five days a week. Unlike a lot of Houston “barbecue” joints that barely use any wood while cooking the meat in a gas-fired appliance, Brooks blasts his brisket with smoky goodness. Minimal trimming produces a crusty fat cap and juicy meat. Ribs, links, and pulled pork are all top-notch; kicked-up baked beans and homemade garlic potatoes are excellent. Note: this is mostly a take-out joint. There’s one picnic table chained to the trailer, but don’t be surprised if you see loyal customers sitting in their cars and eating in the parking lot. When Adrian Handsborough took over his family’s convenience store on Gessner in 2005, he decided he wasn’t interested in selling cupcakes and lottery tickets. He wanted to sell barbecue. So Virgie’s Place morphed into Virgie’s Bar-B-Que (Virgie is Handsborough’s mother’s name). Since then, his smoke-heavy brisket and tender spare ribs have become well known to Houston barbecue lovers who, ordering at the counter, can see the big steel cylindrical smoker through a window. A fire a couple of years ago only slowed Handsborough down temporarily—he reopened in record time with a newly remodeled kitchen. Continuing the curious and seemingly combustible Texas tradition of situating barbecue joints next to gas stations, Ray’s sits in a bright corner of a building attached to a Shell station on Old Spanish Trail. Pitmaster Ray Busch started smoking meat part-time out of a trailer, eventually graduating to this brick-and-mortar joint in 2009. Staples like brisket and pork ribs are consistently great. Try the traditional African American “juicy links,” sausage casings filled with finely chopped beef with lots of tallow and spices. They’re called “Lott’s Links” here, named after a beloved but long-gone neighborhood barbecue joint. The surprise stars on Ray’s menu are the Cajun and soul food specialties; the gumbo and fried catfish sometimes steal the show. Jerry Pizzitola spent his childhood tagging along with his dad visiting legendary Houston barbecue joints like Matt Garner’s on West Gray, Lockwood Inn on Lockwood, Green’s Barbecue on Almeda, and Little Green’s (later to become Drexler’s Bar-B-Que) on Dowling. When one of his favorite barbecue joints, the old Shepherd Drive Bar-B-Q, was slated to close, he took it over and opened Pizzitola’s. Through an arrangement with the family of the original owners John and Leila Davis, he was able to grandfather in the old-style brick pits that produce some of the best pork ribs, links, and chicken in the city. Lenox Bar-B-Q is one of the oldest continuously operating barbecue joints in Houston. Started in 1949 by barbecue impresario Leonard McNeill, the place is now owned by Erik Mrok, whose father was a friend of McNeill’s. When Mrok received notice several years ago that a new light rail line would plow right through his dining room, he announced he was going to close. But then he got a bright idea: tear down the dining room in front and keep the kitchen and smokers at the back of the property. Lenox is just a takeout place now. Mrok is actively looking for a nearby sit-down location but the decades-old rotisserie smokers still crank out great brisket, ribs, and links. Greg Gatlin was raised in Houston, graduating from St. Thomas High School and Rice University. 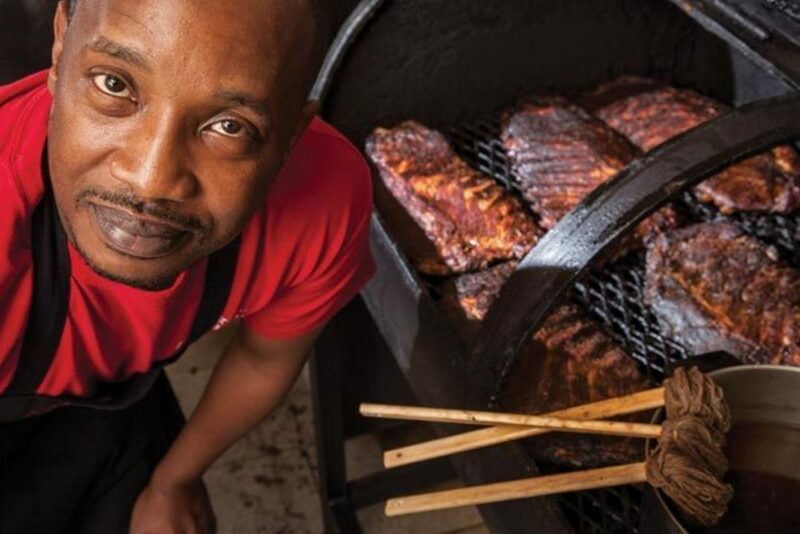 The self-taught pitmaster left his office job after deciding he wanted to barbecue for a living. He and his family began catering circa 2008 and opened the current location for Gatlin’s BBQ in 2010. 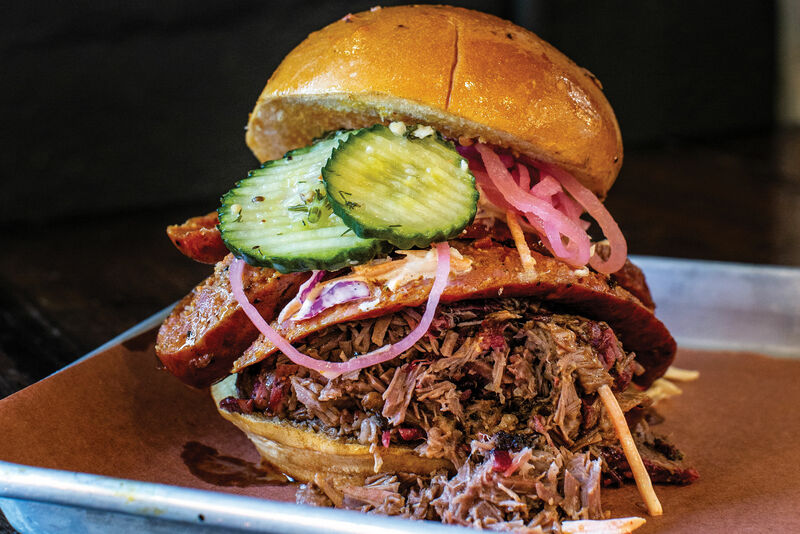 The brisket is consistently great, the St. Louis-cut ribs are some of the best in the city, and the pulled pork with vinegar barbecue sauce is bringing a taste of the deep South to the Houston Heights. The rambling, black-and-pink structures that make up CorkScrew BBQ sit on a leftover vacant lot in a sea of gray and brown strip centers in the suburbs just north of Houston. 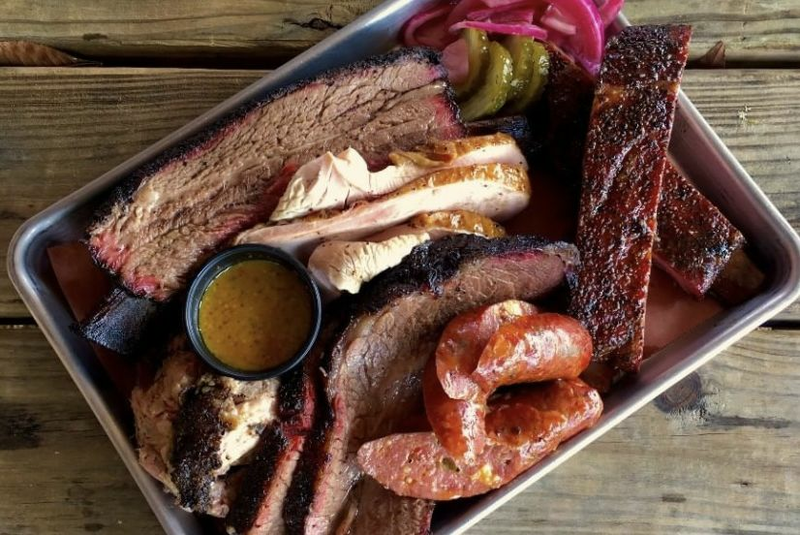 Owners Will and Nichole Buckman continue to scramble to keep up with the increasing crush of ’Q hounds who find their way out to this little barbecue joint, which opened about two years ago. They recently acquired a new smoker and kitchen trailer, which should push their sell-out time to later in the day (call ahead!). Located on Broadway in Galveston, just past the end of I-45, Leon’s welcomes visitors with classic East Texas-style barbecue. An 18-foot cylindrical smoker sits out back, surrounded by cords of oak wood and a more up-to-date, but still wood-fired, rotisserie rig. Owner Leon O’Neal has been smoking meat for over 25 years, and his brisket and ribs reflect that experience. His spicy green beans, dirty rice, and other Cajun/Creole sides are excellent. And so are his “downtown links,” his own spicy, garlicky version of juicy beef links. Beaumont may be stretching our parameters a little, but if you can make the trek east, don’t miss Patillo’s. One of the most unique barbecue joints in all of Texas, Patillo’s Bar-B-Q recently celebrated 100 years in business. The sliced beef plate arrives with strips of smoked brisket soaking in a rich, cumin-y sauce (really more of a gravy) redolent of Mexican and Cajun spices. But the standouts are the homemade East Texas juicy links that truly live up to their name: breaking into one releases a flood of orange-tinted fat that pools below the crumbly beef filling. Grab a slice of white bread, sop up some fat, scoop up some of the garlic-and-spice-infused ground meat filling, and fold it over for an impromptu link sandwich that you’ll find nowhere else in Texas. Barbecue expert J.C. Reid has eaten his way across the state and is currently documenting East Texas ’cue for the Houston Barbecue Project.